The Third Annual UC Berkeley Sociological Research Symposium also brought together more than a hundred students from multiple disciplines and universities to share research among a friendly community of scholars. 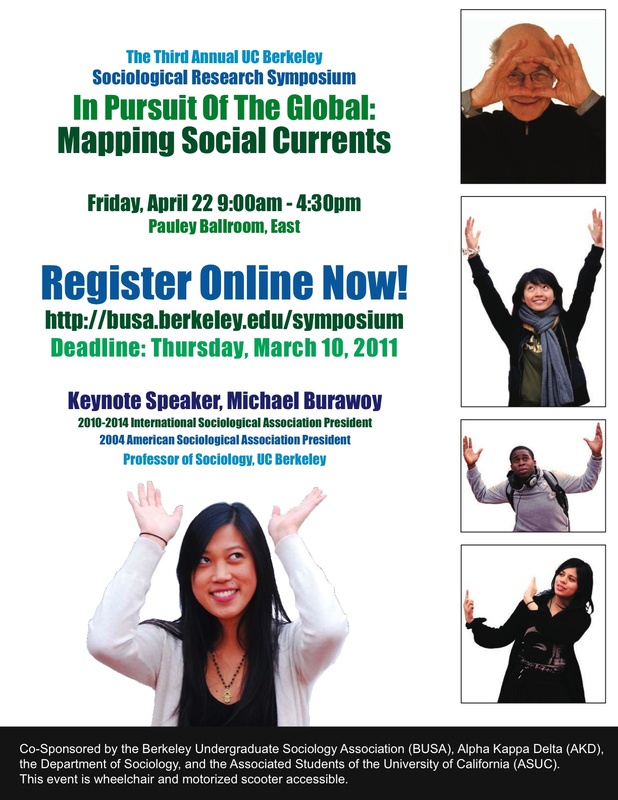 As a guiding framework for the conference, the year’s theme was “In Pursuit of the Global: Mapping Social Currents.” Our opening keynote speaker was Michael Burawoy, a famed UC Berkeley sociology professor who is the current 2010-2014 International Sociological Association President and was the former 2004 American Sociological Association President. Throughout his sociological career, he has engaged with Marxism, seeking to reconstruct it in the light of his research nnd more broadly in the light of historical challenges of the late 20th and early 21st centuries. To conclude, the Symposium celebrated its 3rd birthday with desserts and celebration, where the Danesha McCoy Award was given to four outstanding Symposium undergraduate presenters for their contributions to the UC Berkeley academic community.